Cash transfers (aka cash-based responses) are mechanisms to provide populations with a form of cash or a cash-equivalent (i.e. vouchers). Cash transfers can serve as a temporary source of income or, in an emergency context, can be complementary to in-kind distributions such as food aid or non-food items. In addition to meeting basic and immediate needs such as water, food, and shelter, CTP can also achieve longer-term objectives such as restoring or protecting livelihoods. Although food aid and in-kind responses are dominant in humanitarian and emergency response, cash-transfer programming (CTP) is a mechanism that is quickly growing, both in scale and the number of actors, to provide immediate relief to people after disasters. As new technologies for delivery options also begin to emerge within the banking industry, aid agencies should collaborate closely with governments and private sector partners in order to develop clear guidelines, policies, and organizational capacity to implement cash trasfer programming in post-disaster settings. Source: © ICRC and International Federation of Red Cross and Red Crescent Societies 2007. For more details see the Cash in Emergencies Toolkit. Pre-disaster: In preparation for a predictable shock or as part of a disaster risk reduction program. Initial stages of a disaster: To meet immediate, essential food, non-food and income needs and/or protect/re-establish livelihoods and provide shelter. Recovery or transition period: To help re-establish/support livelihoods and/or provide shelter or short-term [Source: ICRC]. Before undertaking CTP, it is essential to conduct a market analysis and needs assessment to first determine if CTP is a viable option and if so, to identify the best delivery option using context-specific analysis. The assessment should weigh the benefits and drawbacks of different delivery options, from the perspectives of both the delivering agent and the recipient. Availability of products regionally and/or nationally. Surplus production available within a reasonable distance of the affected population. Traders willing to participate (in a voucher programme) and with the financial capacity to purchase goods and the logistical capacity to transport them into the region. Geographical accessibility of shops/markets to recipients and a certain freedom of movement. No excessive taxation of goods (which may lead to increased prices or hamper the ability of the market to provide necessary items). A functioning and reliable system through which payments can be made to traders (voucher programmes) and/or recipients. A reliable recipient identification system. Existence of a clear withdrawal strategy. Acceptable security levels and awareness of possible threats to staff and recipients. The integration of cash training in disaster preparedness and contingency planning is critical to rolling out cash-based programs in a timely and effective way. Increasing capacity and cash preparedness requires investment and a sustained commitment to training and investigating new tools before a crisis hits. For National Societies, achieving this level of investment requires internal advocacy and buy-in from high levels of leadership. Click here for IFRC's guidance material for National Societies to facilitate internal advocacy regarding cash transfer programming. 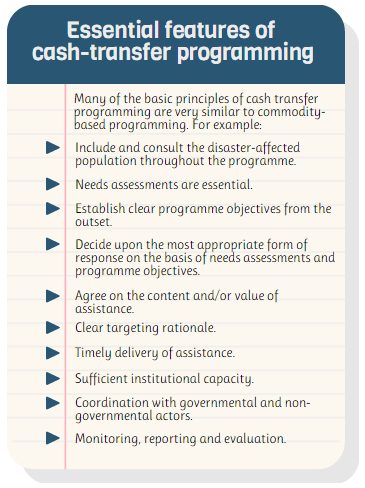 Effective preparedness in cash programming includes i) Ensuring that CTP is included in response strategy and policy, ii) Planning to work with others in CTP, iii) Preparing to manage beneficiary information, iv) Planning for monitoring and exit strategies, and v) Setting up implementation mechanisms in advance. Response times for CTP implementation can be significantly improved by establishing pre-agreements with service providers, establishing clear criteria for CTP assessments and market analysis, and adopting cash-based elements more systematically into contingency planning. Moreover, as the number of actors implementing CTP in emergencies and the scale of the programs continue to increase, so does the need for coordination around implementers and programming. Click here for a more detailed look at IFRC guidance material on cash preparedness. Learning opportunity: The IFRC offers an "Introduction to Cash Transfer Programming" course, which has been developed in partnership with CaLP (Cash Learning Partnership). The aim of the training is to build basic awareness of the issues associated with cash transfer programs as well as cover the key principles and conditions required to support the appropriate use of cash and vouchers. The course is currently available in English. Sign up for the course. Assessment: Action aimed at understanding a situation in order to identify the problem(s), the source of the problem(s), and the consequences of the problem(s). Baseline data: Baseline data are initial information collected during an assessment. Baseline data include facts, numbers and descriptions and permit the measurement of the impact of projects implemented by comparing the situation that existed before and after project implementation. Conditional cash transfer: Receipt of the cash transfer is conditional upon the beneficiary providing a service of some kind (such as work); on using a service such as attending a school or health clinic; or spending the transfer on an agreed commodity or type of commodity, such a shelter or restarting a business. Economic security: A household or community is economically secure when conditions allow it to meet its essential economic needs in a sustainable way, without resorting to strategies which are damaging to livelihoods, security and dignity. Evaluation: The systematic and objective assessment of an ongoing or completed operation, programme or policy, its design, implementation and results. The aim is to determine the relevance and fulfilment of objectives, as well as efficiency, effectiveness, impact and sustainability. Market analysis: Research intended to understand how a market usually functions, how it has been impacted by a crisis and to identify the need for and most appropriate type of support. Research can include information on supply and demand, price changes and income/ salary data. Monitoring: The ongoing task of collecting and reviewing programme-related information. The data gathered during monitoring should allow for programmes to be adjusted as necessary. A monitoring plan should be established during the programme design and based on the programme goals, objectives and activities. Unconditional cash transfers: Cash transfers from governments or non-governmental organizations given without conditions attached to individuals or households identified as highly vulnerable, with the objective of alleviating poverty, providing social protection, or reducing economic vulnerability (see conditional transfers above). Unconditional cash transfer Unconditional cash transfers are given with no conditions as cash to how the money should be used. However, it is assumed that if basic needs have been identified in the assessment, the money will be used to cover these needs; if support to livelihoods or productive activities has been identified as a need, the cash distributed will be used for this. Unconditional (and universal) cash transfers are often used immediately at the start of an emergency. Conditional cash transfer Conditional cash transfers are given on the condition that recipients do something (e.g., rebuild their house, plant seeds, provide labour, establish/re-establish a livelihood). Commodity or cash vouchers Commodity vouchers stipulate the items (and their amount/weight) or services for which the recipient can exchange their voucher. Cash vouchers have a specific value and can define a service and an item or a range of items for which the voucher can be exchanged. Alternatively the voucher can allow the recipient freedom of choice as to what to purchase with their voucher. Combined vouchers (cash and commodity values) also exist. Vouchers can be exchanged in pre-selected shops, with specified traders/service providers or at specifically organized fairs. Cash for work (CFW) Payment for work on community or public works programmes which will improve or rehabilitate community services or infrastructure.Wages should cover basic needs, but be slightly below market levels to avoid competing with the labour market. Social assistance transfer Repeated, unconditional, predictable cash transfers provided to longer-term vulnerable or destitute households or specific individuals (e.g., the elderly, pregnant women). These are preferably implemented in conjunction with government agencies and with requisite political support.